Presidential Fruit Basket. Add a little something special to a fresh fruit basket. 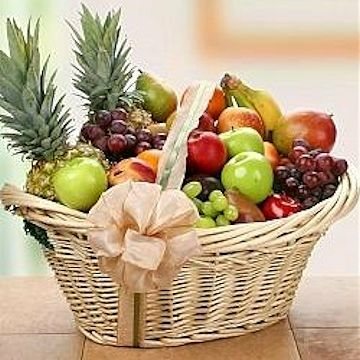 Our affordable Presidential Fruit Basket is accented with hard candies and loaded with the finest local and tropical fruits available. The impressive quantity and assortment of fruit (such as pineapple, oranges, apples, kiwi, nectarines, peaches, pears, grapes, and coconut) make this basket first in its class. Exact basket and fruit/ gourmet selection may vary by season and delivery location. Deluxe basket is shown.